Palisade fencing is a high spec security fencing it is designed to provide a formidable barrier against intrusion and theft. It is manufactured using hot-formed and cold-rolled substantial steel sections. It is a cost effective way to providing a high level of security to the boundary line of any property. Posts - 100mm x 55mm RSJ or 102mm x 44mm RSJ or 127mm x 76mm RSJ depending on height of the fence. Posts installed at 2.75m centres. Rails - Generally 50mm x 50mm x 6mm RSA - 2no per bay. 3no per bay in more secure areas. Fixings - M12 permacone nuts and bolts connect the rails to a fish plate that slides through slots in the posts. M8 permacone nuts and bolts or 6mm anti vandal rivets connect the pales to the rails. triple pointed or rounded and notched. 17no per 2.75m bay. Color avaible: natural aluminum color, black, white, gray, green, etc. •.Lineation , first place of the Post installation site and to draw the hollow of bottom plate . • Punching , second use hand electric to drill holes and plate screw into the hole , unscrewed the screw. • Docking , angle rail is fixed to the post with fish plate , and then installed plates to the angle fence rail with anti-theft screw. • Continue .and so on ,until this project is completed. It can be widely used in yards, garden, airports, power plants ⊂stations, petroleum & chemical facilities, factories, ports of entry, water treatment & storage ect.. Delivery detail: About 7-15 days after receiving the deposit payment . Looking for ideal W and D Pale Palisade Fence Manufacturer & supplier ? We have a wide selection at great prices to help you get creative. 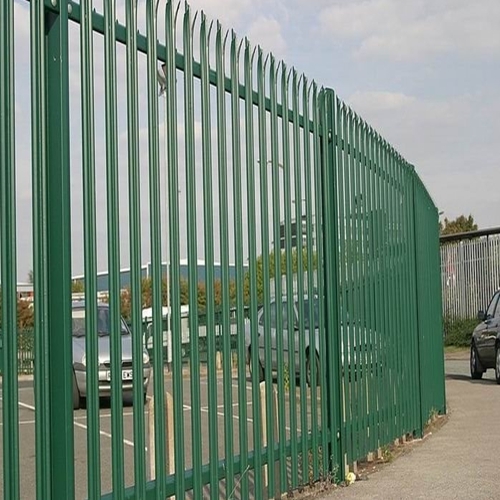 All the 2.4m Palisade Security Fence are quality guaranteed. We are China Origin Factory of Hot Dip Galvanized Palisade Fence. If you have any question, please feel free to contact us.